This is a sponsored post. I received this book for free to review it in exchange for this product. This post contains affiliate links. I have talked about the book Super Baby Food on this blog several times. I love the book! 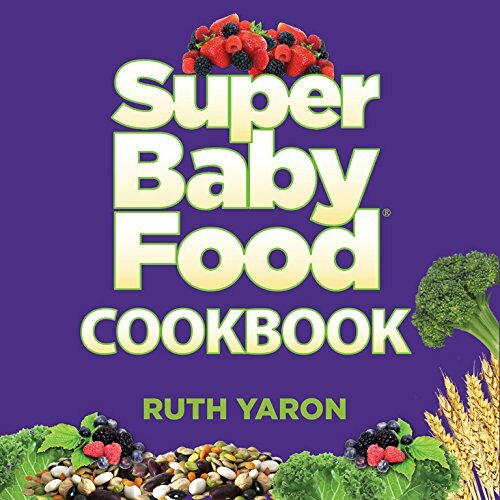 The author, Ruth Yaron, has just released a Super Baby Food cookbook. Hurray! This book is full of recipes for baby on up through children. The recipes include full color photos, which I always love in a cookbook. It is also much smaller than the big purple book, which is handy for using in the kitchen and/or taking around with you when on the go. This is kind of like the Cliff’s Notes version of the original book. If you want healthy food ideas for your baby and don’t need the massive amounts of information in that book, you can get this book and just put it into action. Or if you are like me and love the massive amounts of information but also love photos for recipes, this is a great addition to the Super Baby Food book you already have. Nutritious, delicious and easy to follow recipes that include favorite ingredients such as fruits, vegetables, grains, and legumes, as well as recipes for smoothies, nut milks, granola, and mock ice cream—many the whole family will enjoy! A bonus of “healthy extra” tips and how to use them in recipes, including chia seeds, wheat germ sprinkles, hemp seeds, flax seeds, and more. Super Baby Food recipes come to life, from the simplest Avocado Smash to the infamous “Super Porridge,” to complete breakfast, lunch and dinner meals. You can enter to win your own copy below! You must enter the giveaway to have an entry. No entries are mandatory–you can enter using one or all options. But as I said, you do have to enter to have at least one entry. You must fulfill the rules of each entry for each entry to count. If I see the entry is not valid (did not meet entry requirements), I will disqualify your entry. Trust me, I check. Entries will be accepted until 12:00 AM December 12, 2015. The winner will be randomly selected through Rafflecopter. The winner will be announced sometime after the winner is chosen. I will email the winner. Once the winner is announced, you will have one week to contact me or another winner will be chosen. Be sure to check back and/or check your email. The only thing worse than not winning is to win but not realize it in time. I will not use your email address for any purpose other than contacting you if you are the winner (and FYI, I don’t have access to the email addresses except for the winner). US or Canada shipping addresses only. Looks like an awesome book! I checked out the website! I visited the website. I would love to have this as a resource for my little one!